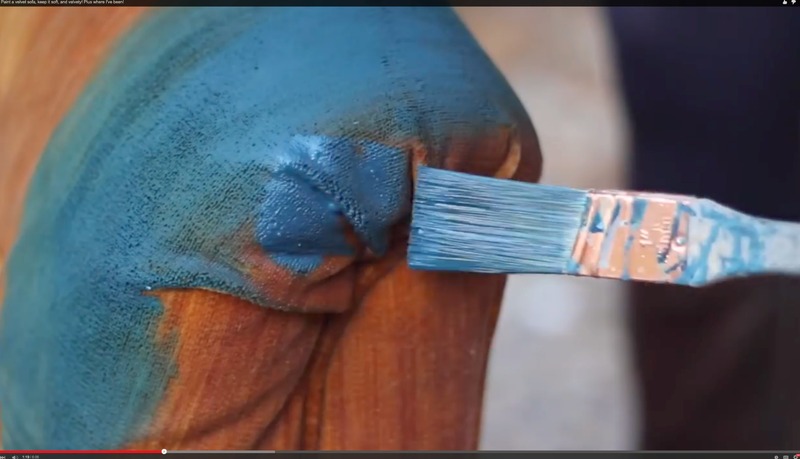 Will the paint come off on your clothes? It is comfortable to sit in? Will this work on leather? velvet? microfiber? Vinyl? Does the paint chip off over time? Does the sofa smell like paint? Does moisture get trapped in the fabric? Why didn’t you use a fabric medium? 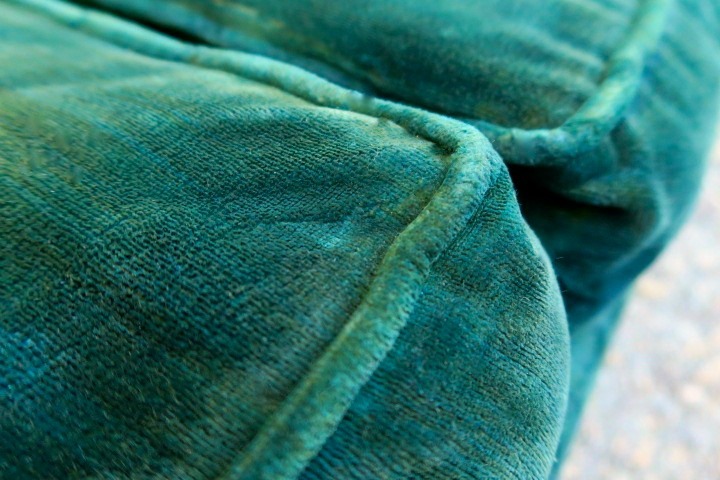 ANSWER– The sofa I painted 3 years ago (pictured below) was my 1st attempt and it was a flat woven cotton poly blend. 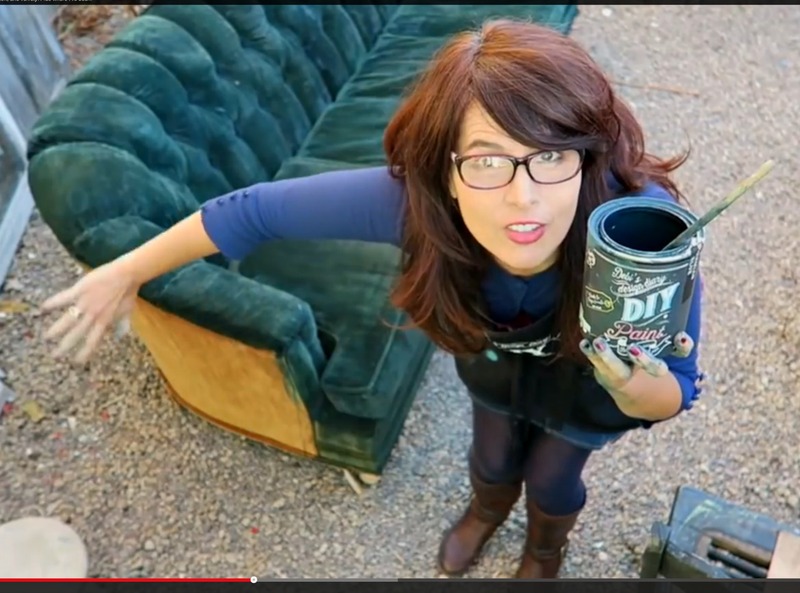 After I painted that couch, it felt like pleather, it did crack and chip and it took 2 quarts of paint. It was not very soft or comfortable to sit in but it wasn’t scratchy. It was better than the ugly stained fabric that was on the sofa when I found it, but not really something that you want to snuggle up on. It changed the feel of the fabric a lot. 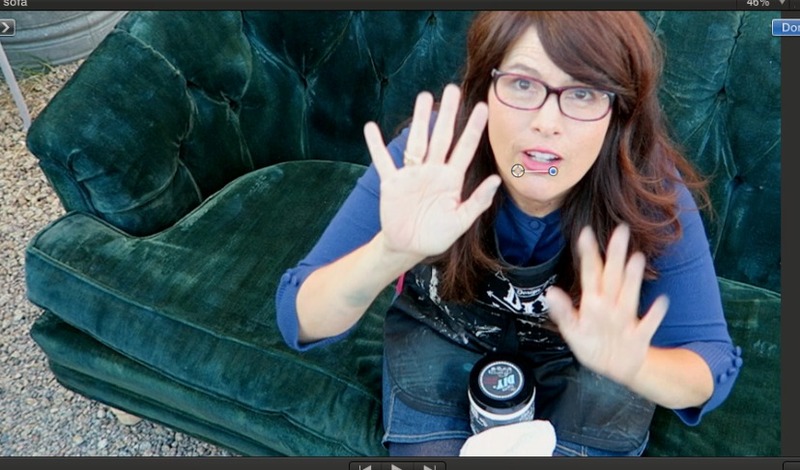 After that experience, I didn’t think it was possible to paint upholstery without creating major issues. Painting velvet seemed impossible, I advised against it every time someone emailed me asking about it. HOWEVER….About a month ago, my friend Beth Tidwell from Farm Fresh Vintage Finds told me that she had painted some upholstered chairs and retained the soft feel of the fabric by spraying the chair with water and adding water to the paint. 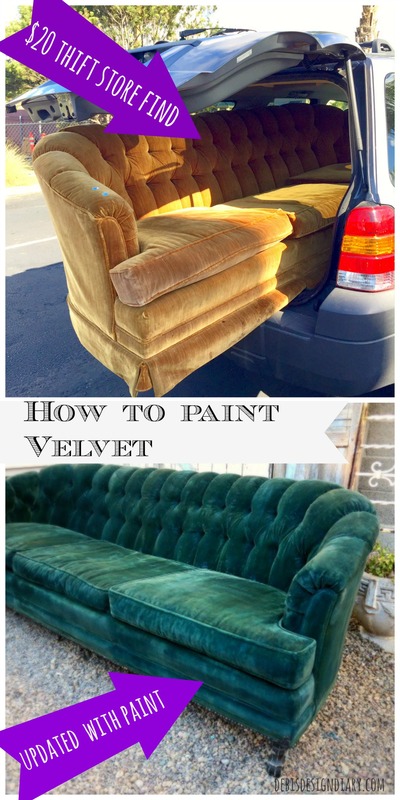 I did some googling and found several tutorials that claimed this would work, even on velvet! 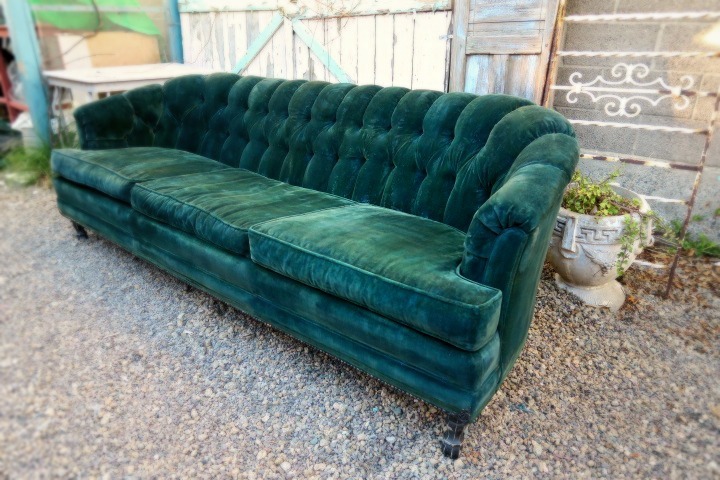 Then I found this velvet sofa!!! 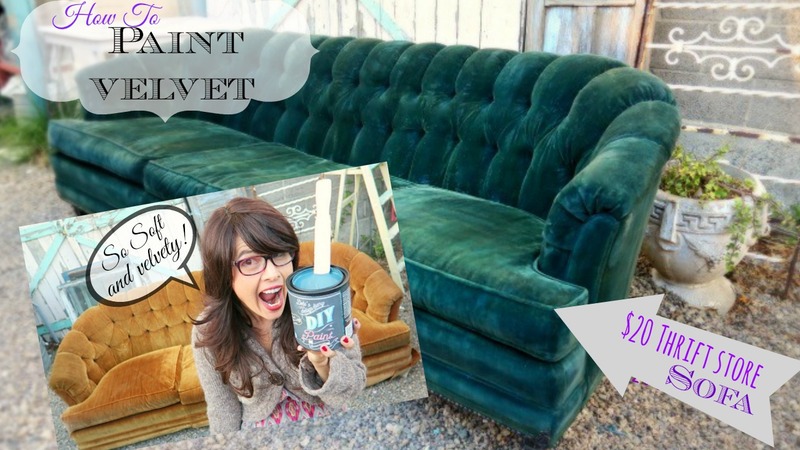 A few weeks ago on the way to work I prayed for a velvet sofa, I wanted to paint it and put it in my new house. I also needed it to be very very cheap because my budget is tight. I stopped at my community thrift store and found this ugly gem with potential for $20! I love this color beyond words! I am so happy with this sofa! It is now in my living room! I have snuggled up on it and it feels so soft, so velvety and looks like an Anthro sofa that might have cost a few thousand $. Question; Why didn’t I use a fabric primer? DIY liquid patina can work like a fabric primer, but I decided not to use it this way because I thought it might change the velvet and make it stiff. Answer: Every fabric primer I have tried, is used to create a flexible barrier in-between the fabric and the paint, this is supposed to prevent cracking and chipping… primers can prevent some cracking but I still had issues with cracks but most importantly, primers prevent the paint from sinking into the fibers of the fabric and thus the fabric changes to a stiff, outdoor fabric or pleather like texture. Question; Does the couch smell like paint? Answer: My couch smells better than when i found it. I think all the scrubbing freshened it up and DIY paint is pretty much odorless. Seriously our paint is made from nine ingredients out of all the paints I’ve sniffed (there have been many) this paint has no painty smell, you should totally sniff it out for yourself. 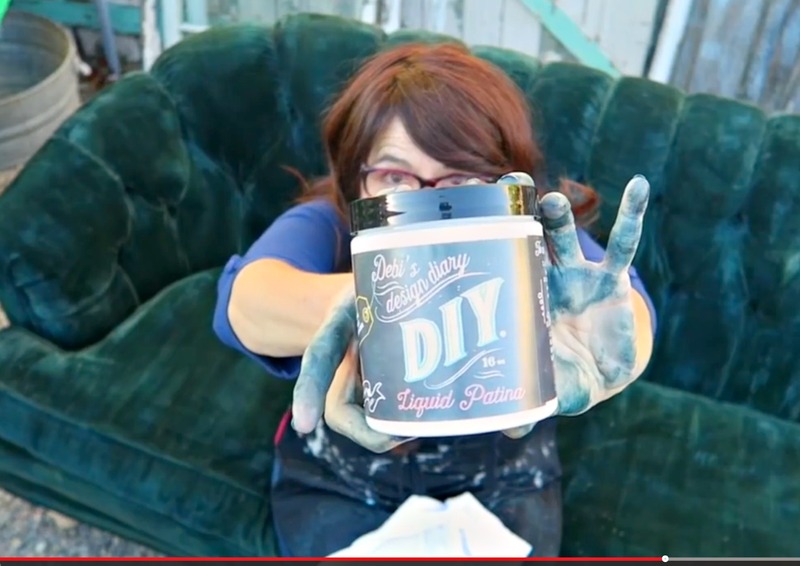 I only added this to the arm of my sofa for purposes of demonstration, because the big question, “will the paint rub off on your clothes?” I did not want to take the time to cover the entire sofa yet again with a top coat. 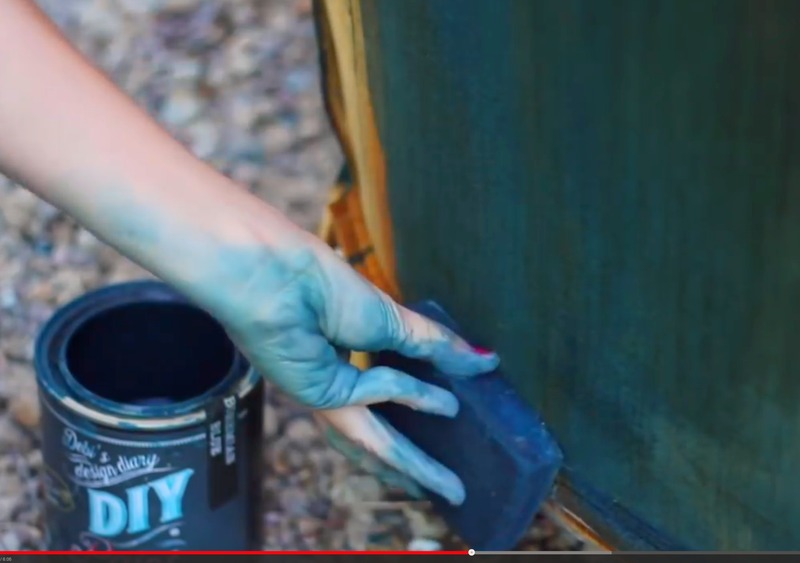 if you want to speed up the cure time of DIY paint, you could try, heat setting it with a hair dryer, putting it in a clothes dryer or scotch guard. I just waited for mine to cure over time because I don’t have kids… DIY is clay based and will cure after several months to an adobe like finish. I could be wrong but I don’t think it’s necessary. My logic, If you paint a wooden chair the paint does not come off so why would it rub off fabric? 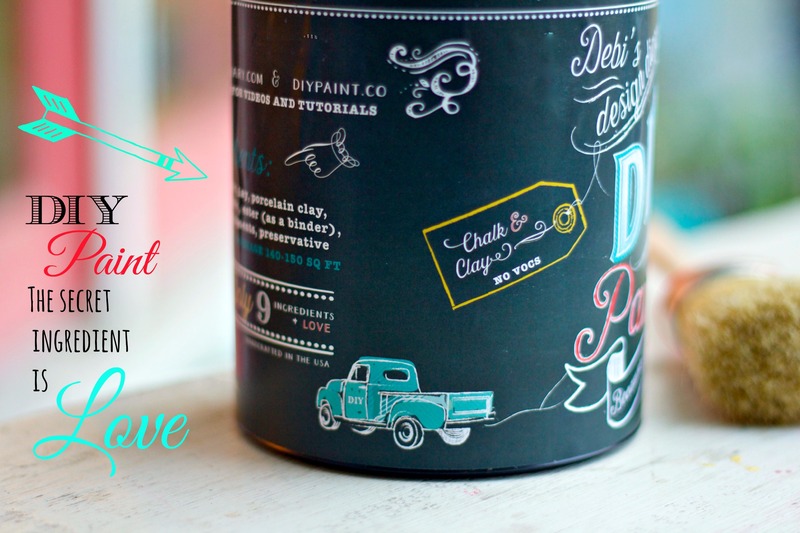 DIY paint will cure overtime without a top coat. I simply did not want to take the time to put another layer on the sofa and I don’t wear white. I’m also curious to see if the paint comes off, so I will give you an update in a few months. **Another thing I forgot to mention is that I used less than one quart of paint. This is a 7 foot sofa and I put on 4 coats, front and back. work the paint in with a sanding sponge you can purchase one on Amazon HERE this will help the paint go into the fabric evenly and avoid a patchy/ tie dyed look. Take care not to put the paint on too thick, you want it to sink in and dye the fabric, if the paint sits on the surface you will change the texture of the fabric and it will loose it’s soft feel. Let each layer dry completely and sand in between. I worked my paint it really well and did not need to sand very much, there were a few spots that were rough on the first coat because I didn’t discover that the sanding sponge was key until later in the process. I used sandpaper in these areas and was able to work off the rough spots. work outside in warmer weather if possible. You don’t want the fabric to stay damp. 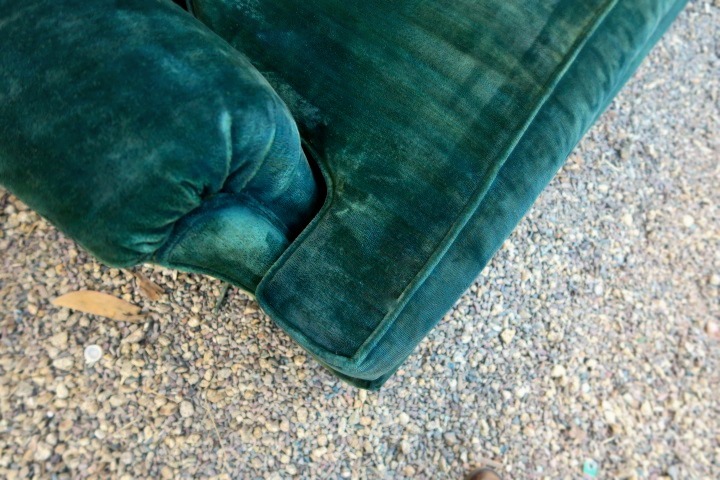 My sofa dried pretty fast even though it rained a few times during the process. Be prepared to spend some time if you plan to paint a sofa, this was a week long project. I’m sure that a chair would be much faster. 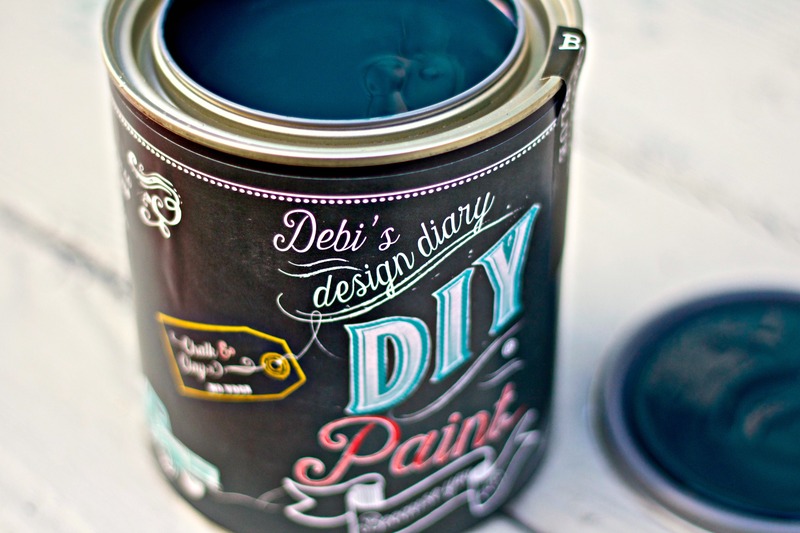 if you decide to add a top coat, be careful to water it down a lot and work it in just like the paint or you will risk changing the texture, after all the time and hard work this would be tragic, so be careful! 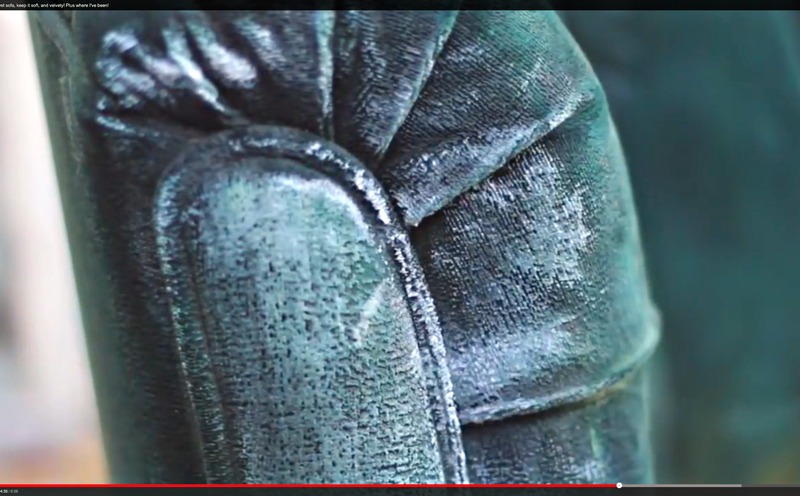 Wax… some say they have waxed over upholstery, I’ve never tried this, i have read that it will change the texture. I did not want to risk that as I really, really love my sofa. If you are unsure, consider painting a test swatch, I used the skirt fabric to experiment before I started. If you don’t have extra fabric consider buying a remnant of similar fabric first. 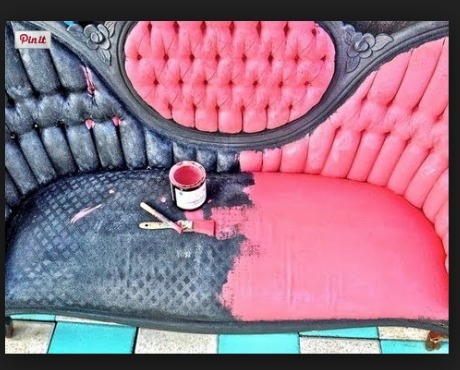 Have you ever painted upholstery? let me know in the comments and please share your tips or tag me on Instagram! Stay tuned for my new Handmade Home series! I just moved into a totally empty house, I’m going to furnish everything from the dishes to the furniture with items found, thrifted and made! Be sure to subscribe so you don’t miss the first episode! I have painted a chair with the glitter and mod podge. From your video a few years ago. The seat was very thick , and it cracked. Maybe it was too thick, or I put on to many layers. 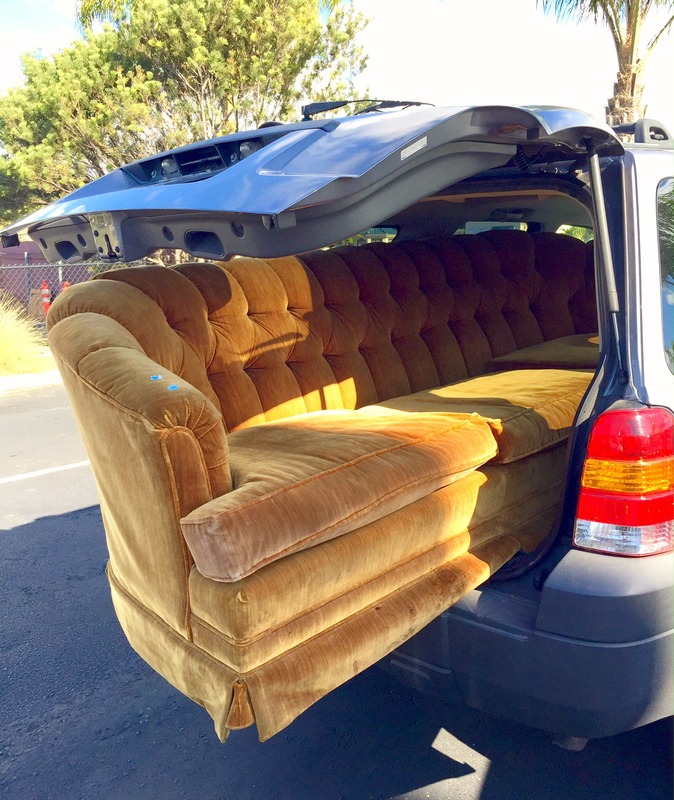 I would like to try the method you just did for the couch , PRETTY ! 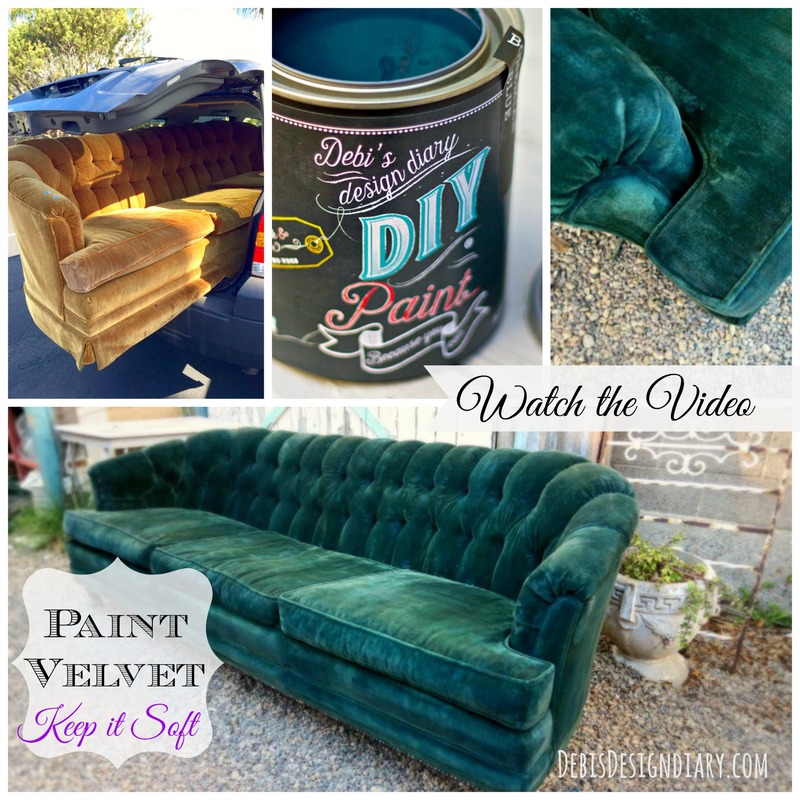 Loved your info on painting velvet sofa.always enjoy seeing ways to reinvent what you have.thank you! Where is the paint sold? This looks great! Is the paint sold in Canada?